So I have been looking online this week at some different brands of variable speed dual action polishers. Something that can help me get some of the light scratches and swirls off of my IS. I have a black IS so scratches and swirls show like nobody's business. Anyways, I looked at Meguiars G110v2, PC7424XP, and Griot's Garage brands, but seem that they are a bit more than I want to spend right now. I browsed over Harbor Freights website to see what all they had, and noticed that they have their originally priced $129.99 6" variable speed dual action polisher on sale for $59.99. Right now they also have a 20% off coupon that can be used either on store or for online purchase. Here goes a few details about this polisher. Speed: 2000-6400 OPMs / Six variable speed settings. Two position side handle & comes with Velcro backing plate. I think this sounds like a pretty decent deal. Thought I would share. The HF orbital seems like it will be OK, but I would test it out on something else first. I had a PC7424 at first, but I ,moved up to a Flex XC 3401. The forced rotation on the Flex made polish jobs faster/easier, but the 7424 got the job done. I think a DA buffer should be in everyone's garage. You'll end up spending more on pads,polish, and wax, so saving on a cheaper machine shouldn't be a deciding factor. BTW, you can't use the coupon since the HF DA buffer is a sale item. Here's a pic of a quick correction I did after making the mistake of letting the dealership was my car. Not a lot of time was spent working on the paint, so I know I could have done much better. Here's a pic after I finished polishing. Usually, I clay if needed, polish, and seal. If your message was meant to be strictly informational...never mind hahaha. Yeah sorry this was more of a FYI. Just letting everyone know that HF Da was on sale. I have never owned or used DA polisher before. So I thought this one being that was on sale would be a decent one to start up with. I can definitely see the difference from the before and after pictures you posted. My mistake was taking my black IS in one of those automatic car washes with spinning brushes. The paint right now has spider web swirls and light scratches. The good seems to be the worst. Just to try getting some practice in. Oh by the way, the 20% off coupon code can be used on this HF DA polisher deal. I just tried it out on their website. 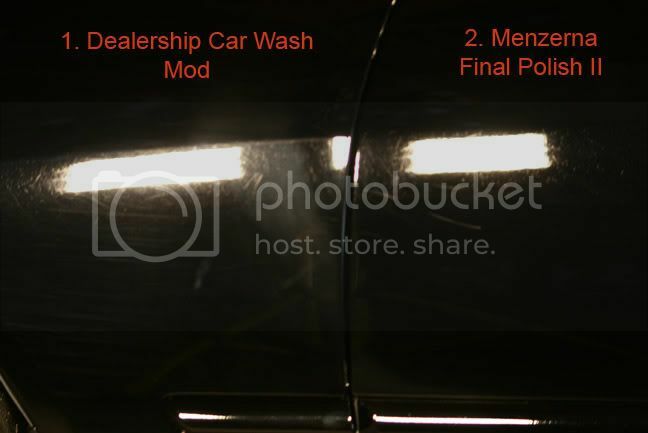 « Restoring Shine to my baby... | Certified Detail Tech. 01 IS300 owner.